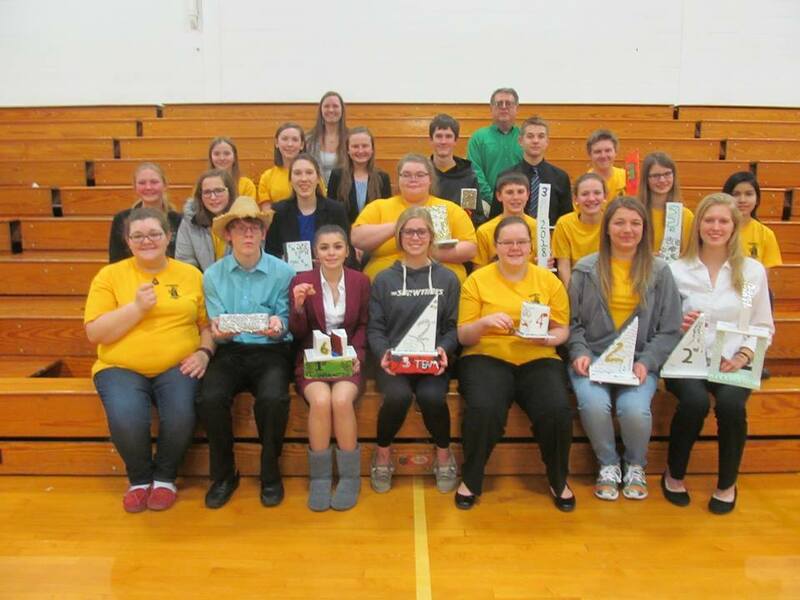 After twenty-two speech teams and over three hundred competitors finished up performances at Wisner-Pilger High School Saturday, the host Gators finished with two champions and a hard-fought third place team finish. The host Gators earned two individual champions, as Veronica Peck claimed first place in Informative and Brett Andersen took first in Impromptu speaking. For Peck, it was one of three final awards earned on the day, as she also placed fourth in poetry and thirteenth in persuasive speaking. Andersen added a third place result in entertainment speaking to his results for the day. Sophomore Jaden Berlin also claimed three final entries, with a runner-up finish in program of interpretation as well as a twelfth place trophy in poetry and a thirteenth place win in serious prose. "We had several speakers that really came up big in very challenging conditions," said Gregg Moeller, Gator speech coach along with Kasey Alexander and WSC student teacher Kristin Jindra. Several Gator speakers earned "Green Final" recognition on the day, for those who finished in the top overall division, including Claire Raabe, third in program of interpretation; Ruby Mares, fourth, program of interpretation; Anjelina Frederic, fifth in program of interpretation; Alecia Keller, sixth in entertainment; Grace Steinmeyer, sixth in informative as well as a second final entry with an eleventh place finish in extemporaneous; and Becca Thompson, eighth in persuasive speaking. In the "White Final" for the next level of finalists, Thompson earned a second trophy as her drama group with partners Claire Raabe and Megan Schoreder finished eighth overall, with the drama team of Aidan Sateren, James Kinnison, Rockney Peck and Payton Biermann taking ninth place overall. Jessica Svoboda rounded out the Gator finalists with a fourteenth place finish in informative speaking. In team competition, Norfolk High claimed first place, with Humphrey second, Wisner-Plger third, Wayne fourth and North Bend Central fifth out of the twenty-two schools competing. Moeller noted that the meet was an excellent test for the Gators as they approach conference and district action, and that the team and their parents contributed beyond competing throughout the day. "The speech team members and especially their parents were wonderful with their assistance, especially with food and cleaning up afterward," Moeller noted. "They helped make this meet a good one for all involved." Wisner-Pilger hosted the Pilger Cardinal Triangular with Laurel-Concord-Coleridge (coached by W-P alum Alex Glaubius) and Wakefield Tuesday, then the Gators host the East Husker Conference's North Division tournament Saturday. Moeller said that the Gab-Fest was a good preview of the East Husker, as all of the conference's teams competed. "It will be interesting as four teams have a legitimate chance to win the whole thing. The team race will be wide open." The conference tournament Friday will be free, and open to the public.